Today I really wanted a sandwich. 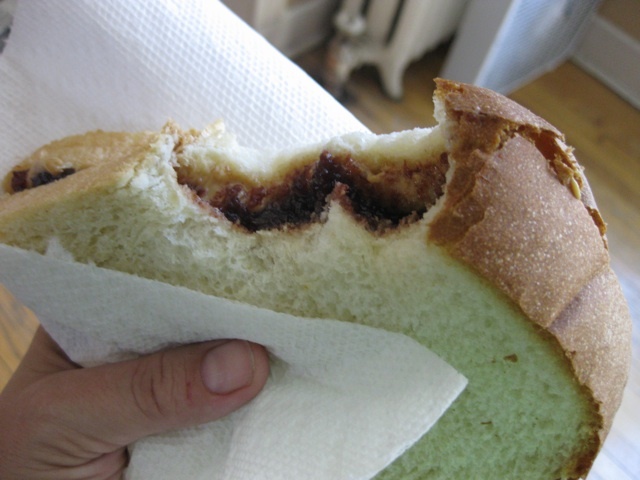 Specifically, a peanut butter sandwich on smooshy bread. A PB&J on funky artisanal whole grain breads topped with spelt and sprouted flax was not going to cut it. I wanted that soft, sweet, nutritional wasteland known as white bread. Yeah, I said it. WHITEBREADWHITEBREAD. The classic loaf of our youth but better. Today was not the day to be beat over the head with omega-3 fatty acids, fiber and good for you propaganda. It’s been that kind of a week. For a while now, I’ve been working on perfecting a good white loaf. I’ve got crusty artisanal breads down but hadn’t cracked the code on a good classic sandwich bread. My problem was when I wanted bread I usually didn’t have the right ingredients on hand, often some sort of perishable ingredient. Running to the store really defeats the whole purpose of spontaneous bread baking. I wanted a simple recipe that could be made on the fly with stuff I had in the cupboard. This was a task right in line with my recent pledge to eat more from my cupboard ingredients. Bring it on – I was ready for the challenge. Now then, to complicated matters, I also wanted my loaf have some keeping qualities. Nothing pisses me off quite like baking a loaf of bread only to have it stale and inedible the next day. Even I can’t – or shouldn’t – eat a whole loaf in one afternoon. (I’m admitting to nothing.) How many panzanellas, croutons and breadcrumbs can the average person deal with? So I sought out recipes that had ingredients such as milk, butter or even mashed potatoes that would make a soft loaf and thought about how to simplify them. nice, full rise…perhaps too full? 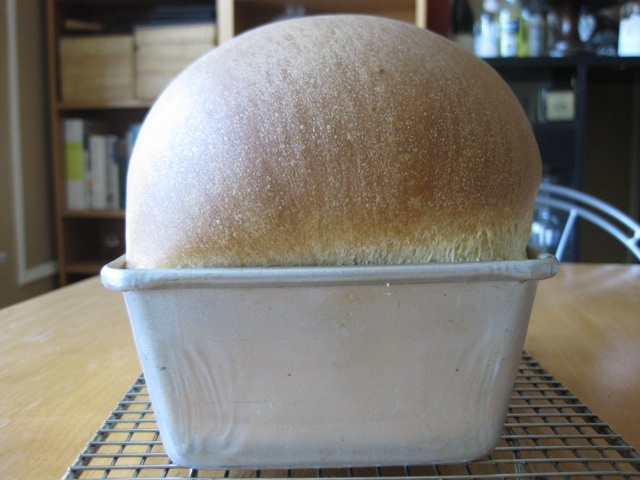 It was a tall order – a soft, pillowy loaf made from pantry ingredients – but I found it. The usual suspects – yeast, flour, salt, a bit of sugar – plus a few unexpected items like instant mashed potatoes and nonfat dry milk powder. Yeah, I know. Instant potatoes and milk powder?? But let me tell you, they add a lovely moistness to the dough and I can keep 99 cent packets in my pantry for when I need them without any worries about sprouting or spoiling. Yes, it is a processed food and something I try to avoid. Sometimes you have to make trade offs in your life and this is one I’ll occasionally take. The loaf can also be made with regular milk and a freshly mashed potato – just adjust the water accordingly. The one thing I couldn’t do away with is the butter. It adds such a great flavor and I always have butter on hand. But if I had to, I could easily substitute the butter with vegetable oil. What can I say, I’m a butter gal. I used my KitchenAid/dough hook combination to mix up the dough but it can easily be made by hand or even in a bread machine on the dough cycle, which is the easiest method ever. Just make sure you take it out after the first rise, shape and do the second rise in a loaf pan for a regular oven bake. I have one of those stupid machines and have baked in it exactly once. I find it much more useful as a dough mixer/riser. Keep in mind that it rises much faster in the bread machine – you may have to allot more rise time if made by hand or in the mixer because the environment isn’t as warm as the machine. No worries. 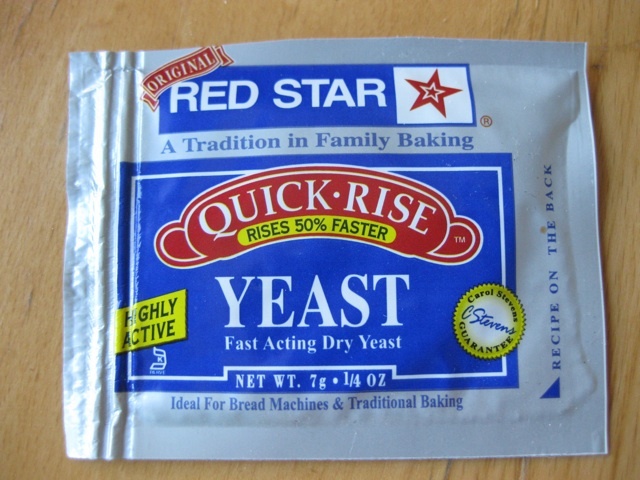 A quick note about yeast – this recipe calls for “quick rise” yeast, which is a dry active yeast that’s processed into smaller particles than “active” yeast so it activates faster and increases rise times by 50%. You can absolutely use “active” dry yeast in the same amount, just expect the rise times to be a little longer. The result will be the same. I’ll be honest, I found the original recipe online. I’ve adapted it a bunch of times and am not quite sure anymore if this is the original recipe or one of my tweaks. I tried to find it again and didn’t have any luck so props to whomever came up with it first. STRESS BAKING THERAPY FACTOR: HIGH. We’re talking homemade warm fresh oven baked bread. On the scale of comforting foods, it’s damn near at the top. In terms of baking for others, whoa baby. People will freak out – literally freak out – if you bring them warm homemade bread. Throw some homemade jam in there and you can take over the world. Mark my words. Makes one delicious loaf. If you have a bread machine, you can use the dough cycle. Remove it from the machine after the first rise and pick up the recipe at Step #7. For the sponge: In the bowl of a standing mixer, dissolve the yeast with a pinch of sugar in 2 Tablespoons of lukewarm water. Let the yeast and water sit at room temperature for 5 minutes, until the mixture has bubbled and expanded. For the dough: To the yeast, add the additional water, flour, salt, additional sugar, softened butter, nonfat milk and instant mashed potatoes. Fit the mixer with the dough hook and mix on medium speed just until the dough releases from the side of the bowl, about 6-to-8 minutes. Turn out onto work surface and knead dough together lightly with your hands. 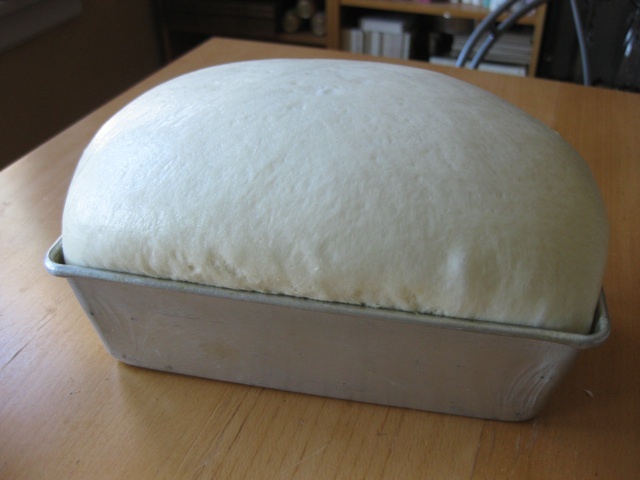 First rise: Place the dough in a lightly greased bowl, cover with plastic wrap and place in a warm place to rise until it’s nearly doubled in bulk – 45 minutes-1 hour. Give it enough time to become quite puffy. 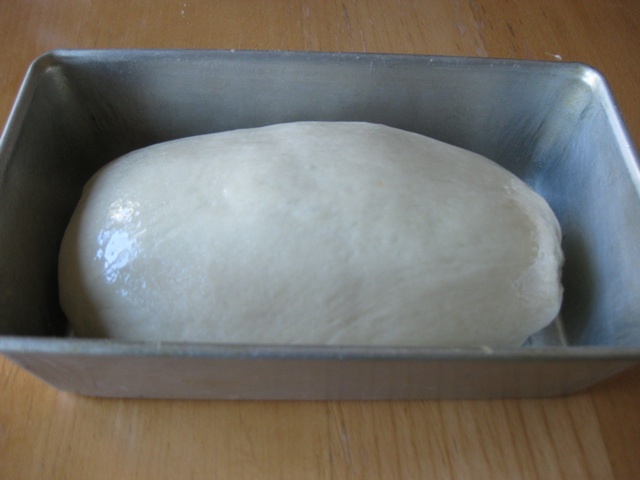 Shaping: lightly grease a 8 ½” x 4 ½” loaf pan and set aside. Punch down the dough, turn out onto a lightly floured work surface and shape it into an 8″ log. Transfer the log to the prepared pan, smooth side up. 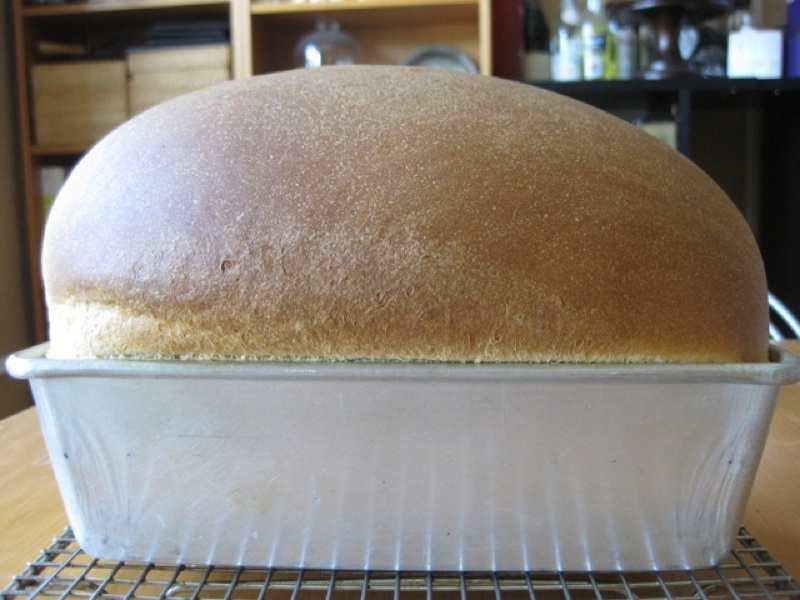 Cover the pan loosely with lightly greased plastic wrap and allow the bread to rise till it’s risen about 1 ¼” over the rim of the pan, about 1 hour. Again, it may rise more slowly for you; let it rise till it’s 1 ¼” over the rim of the pan, even if that takes longer than an hour. While the dough is rising, place a rack in the lower 1/3 of the oven and preheat the oven to 350°F. Bake: for 15 minutes then tent the loaf lightly with aluminum foil, to prevent over browning and bake for an additional 20-25 minutes, until the crust is golden brown, and the interior temperature measures 190°F on an instant-read thermometer. Remove the bread from the oven, and gently loosen the edges and turn it out of the pan. Allow the bread to cool completely before slicing. As soon as it’s completely cool, wrap it tightly in plastic wrap; or in a plastic bag, air pressed and fastened securely at the top to prolong shelf life. I baked it! Well, I adapted with the ingredients I had on hand… and it’s a hit 🙂 Loved it, and so did my husband. Will post the updated recipe on my blog with a link to yours. Thank you!! That’s the spirit! Bake with what you have on hand! Looking forward to the post. Makes my mouth water, more than chocolate! I used to bake my bread years ago…when Dean and Sheri were little and in grade school. Then, after hot summers and George eating a buttered loaf in one day, that finally did the bread baking in! i’m totally anti-white bread (what can i say, i’m a product of 70’s food co-ops, carob chips & what-not)… but i have to admit, this looks deeeeeelicious!